Act now to maximise fruit crops and keep your trees healthy through the dry season and beyond. For almost all fruit trees, flowering, pollination, and fruit-set is well and truly complete. Now mulching, feeding and thinning are key to getting bumper crops this season and to keep your trees in shape to avoid poor cropping next summer. Mulching for moisture retention and root cooling is essential. Use pea straw in a doughnut shape about 10 centimetres thick around your fruit trees and berry plants, making sure the mulch doesn’t touch the trunk, which can burn the bark. Mulching after a good spell of rain or deep watering is best. Trees are growing lush new foliage at the same time as fruit, so need a boost of fertiliser. A balanced fertiliser that is not too high in nitrogen will encourage fruit growth rather than leafy growth. 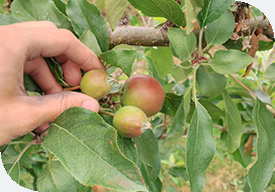 If your fruit trees have a heavy crop, take time now to remove fruit to an appropriate load. You might pay for being greedy this season with an exhausted tree and little or no fruit next year. Thinning also reduces damage from rubbing as the fruit grows, and prevents branches overloading and breaking. Remove smaller fruitlets and anything that has blemishes or damage. Leaving larger fruitlets will give you larger fruit at harvest. Apples and pears can set up to five fruit in a bunch, so should be thinned to just one or two per bunch. Remove almost all fruit from weak branches and the tops of the tree. Kate is a manager at Waimea Nurseries, which supplies fruit trees to garden retailers nationwide. Born and bred in Nelson, Kate joined the nursery 14 years ago with no horticultural experience, though now contributes regularly to garden shows as a fruit tree expert.